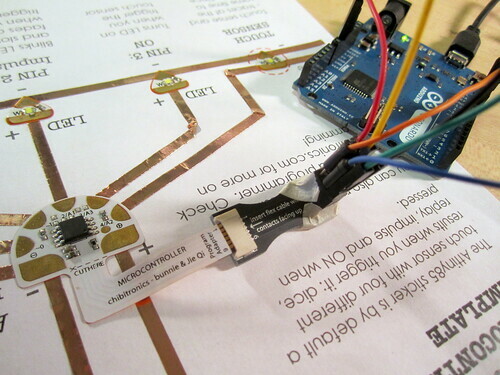 The microcontroller circuit sticker comes with a default touch sensor program. 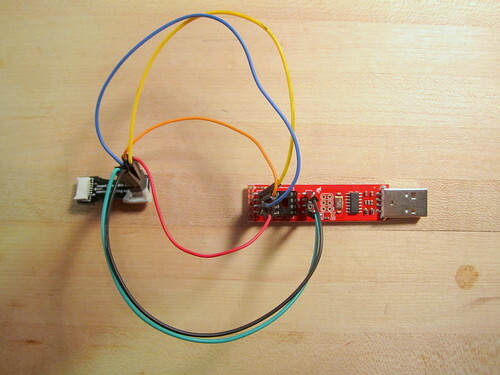 However, you can also use Arduino software to reprogram it with your own code! This tutorial will show you how to reprogram the Attiny85 microcontroller sticker using three programmer options: the Tiny AVR programmer, the AVRISP MKII, and the Arduino as programmer . 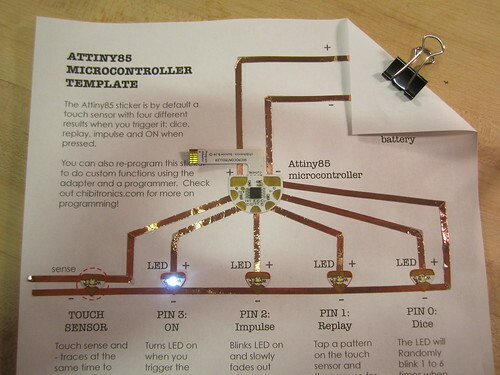 Before programming the microcontroller, first create a test circuit for the microcontroller sticker using the Attiny85 microcontroller template and LED stickers. There is a full tutorial here. Download Arduino onto your computer and follow the installation instructions for Mac OS X or Windows. 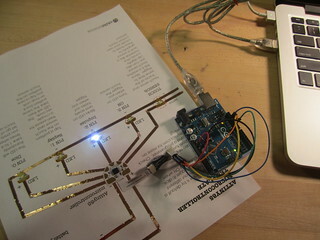 Find your Arduino Sketchbook folder and create a new subfolder called “hardware,” if one doesn’t exist already. 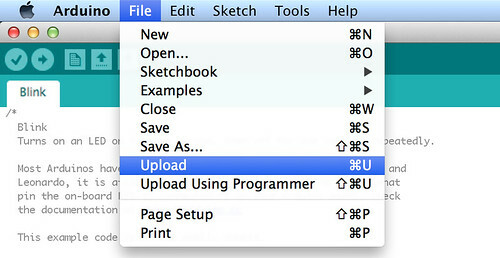 If you have trouble finding your Sketchbook folder, look under File > preferences. 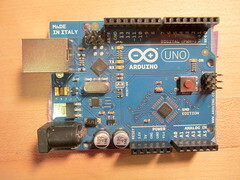 Restart Arduino. Now under Tools > Board menu you should see entries for ATtinys. 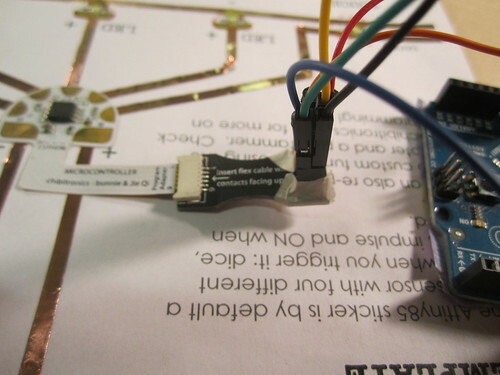 For a more detailed tutorial on Attiny support installation, check out “Programming in Arduino” section of Sparkfun’s Attiny Programmer Hook Up Guide. To prevent potential short circuits, put a bit of non-conductive tape on the bottom of your circuit sticker programming adapter. If you are using a Windows machine, you will need to install additional drivers. Follow the “Driver Installation” instructions here. 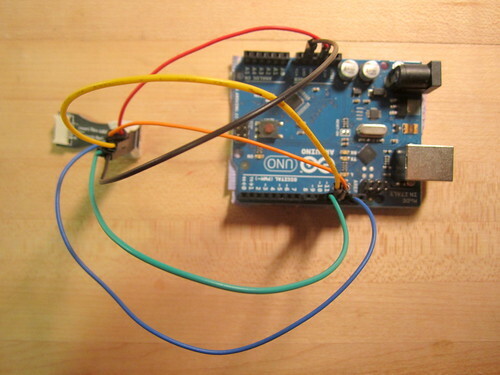 You will also need to turn your Arduino into an ISP by uploading the Arduino as ISP code onto the board. 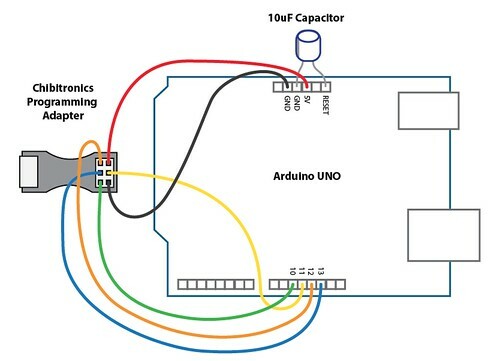 To do so, plug your Arduino into the computer and upload the Arduino As ISP example sketch (under File > Examples > ArduinoISP) For the Arduino UNO, after uploading the Arduino as ISP program you will need to add a 10uF or larger capacitor between the Reset and GND pins.For more detailed tutorials on turning the Arduino into an ISP, try these for the Arduino UNO and Arduino Leonardo. 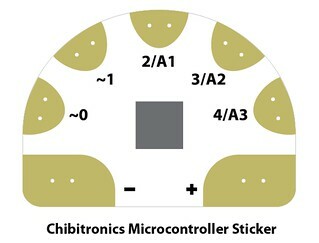 Now you are ready to connect the microcontroller sticker to the programmer! 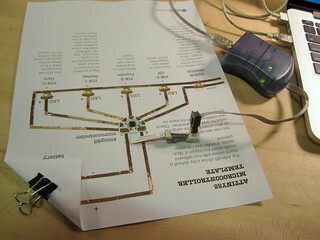 If everything is connected properly, the microcontroller should power on and run the default program. 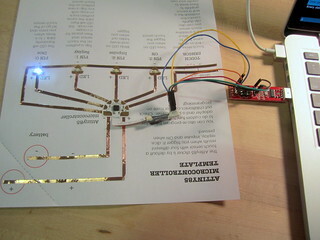 The lights will appear brighter because the circuit is now being powered by your 5V computer USB port instead of the 3V coin cell battery. 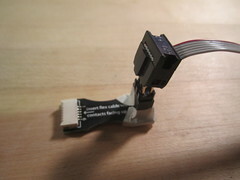 If you are using the AVRISP MKII, insert the programmer tail into adapter and plug your programmer into the USB port of your computer. 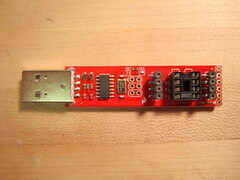 Since this programmer does not provide power to the microcontroller, you will also need to add a fresh coin cell battery to your test circuit. 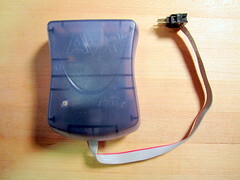 Without battery power, the AVRISP will shine a red light (left). Once you put in a fresh battery, the light should turn green (right). 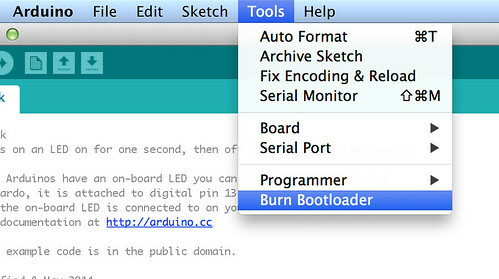 Select Tools > Burn Bootloader to burn the bootloader and test that all of your connections were made properly. 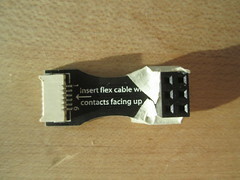 If you see an error message, check to make sure that the connections between the computer, programmer, adapter and microcontroller sticker are correct. 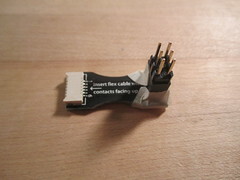 Often a simple loose connection will result in programming errors! 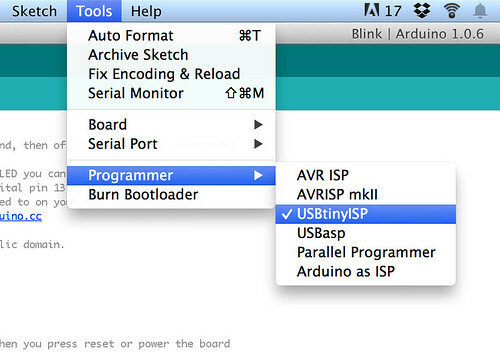 Once the bootloader is successfully burned, the microcontroller is now “blank,” meaning it has no program on it. As a result, it will no longer be running the default program and will not respond to touch anymore. If you would like to reprogram the microcontroller sticker with the default touch sensor program, you can find the code here (hosted on GitHub). STEP 7: UPLOAD YOUR PROGRAM! In the code, replace “13” with “0”. 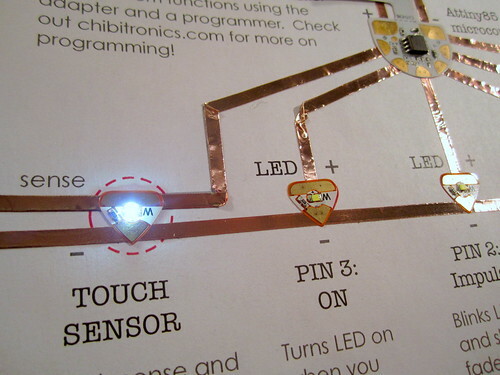 This code will then blink lights attached to pin 0 of the microcontroller sticker. Done! 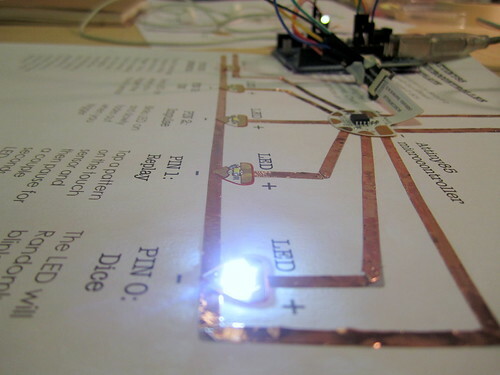 You should now see the LED on pin 0 (originally, the Dice LED) blink on and off. 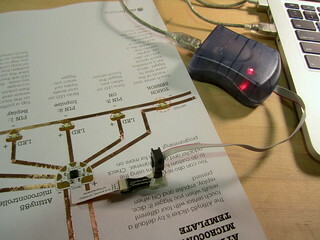 Now try unplugging the microcontroller sticker from the adapter and adding a battery. 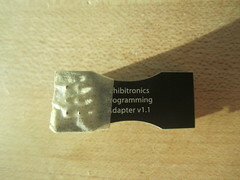 The program will continue to run because the code is now saved on the microcontroller. Note: there is a 4 megaOhm resistor between Pin 4 and + on the microcontroller to create a resistive touch sensor.